The US microgrid market is growing faster than expected, fueled by a rise in new ownership configurations, says a report released today by GTM Research. 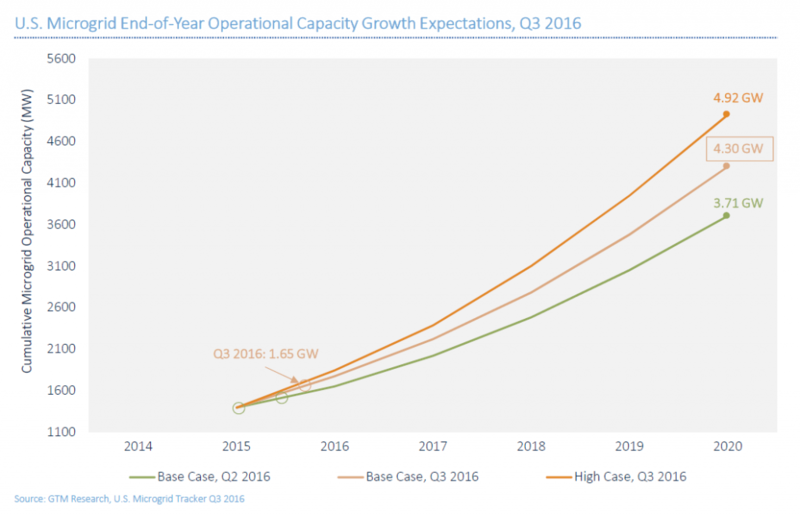 GTM now forecasts that US microgrid capacity will reach 4.3 GW by 2020, up from the research firm’s estimate last quarter of 3.71 GW. The US currently has about 160 microgrids with 1,649 MW of capacity. Should the growth figure hold, the market will expand 116 percent over four years, according to the third quarter report, “U.S. Microgrids 2016: Market Drivers, Analysis and Forecast.” GTM sees US microgrid market opportunity doubling from $836 million in 2016 to $1.66 billion in 2020. Interest is heightening as it becomes apparent that a microgrid can offer ‘stacked benefits’ to help multiple stakeholders involved — utilities, consumers, municipalities and third-party providers. The result is a shift away from single ownership microgrids toward multi-stakeholder projects, which improves microgrid economics, he said. More and more, utilities are among those stakeholders. This brings utility expertise and more investor appeal to projects. Many utility-driven microgrids are built as ‘non-wires alternatives’ microgrids. Utilities partner with developers to install these microgrids to avert the need for larger ‘wired’ capital investments. “A number of large 10 MW plus projects split costs with utilities, allowing utility partners to dispatch diesel or natural gas gensets to address location-specific challenges such as congestion, substation peak demand, flexibility, etc.” Saadeh said. Utilities also increasingly pursue microgrids to accommodate variable distributed generation. Saadeh pointed to examples undertaken by Commonwealth Edison, PECO Energy, Duke Energy, George Power and California utilities. 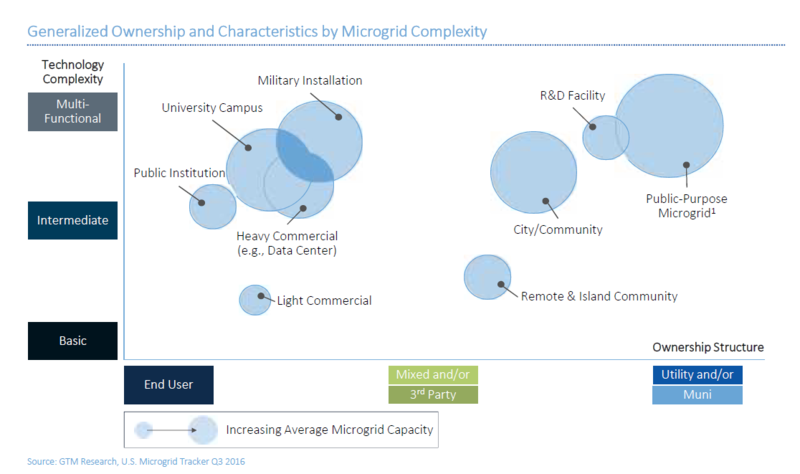 GTM also identified an uptick in military and commercial microgrids. In fact, the military contributed 52 percent of microgrid capacity deployed to date this year. The military is pursuing microgrids largely for energy security or to achieve renewable energy goals. Meanwhile, data centers drove growth of commercial microgrids, which represent 27 percent of capacity to date this year. Community microgrids also remain on the rise, particularly in the Northeast and Alaska, installed often with a public purpose or social intent. Geographically, the industry remains condensed largely in seven states. New York leads, followed by California, Texas, Georgia, Maryland, Alaska and Oklahoma. GTM expects Georgia and Oklahoma to eventually fall out of the top ranking, replaced by states where more microgrids are being planned and utilities back the technology. These include Hawaii, Arizona and New Jersey. Regionally, the Northeast leads with 567 MW of installed capacity, followed by the Southwest with 399 MW, the Southeast 239 MW and West Coast 237 MW, according to the report. Generation consumes the largest amount of capital for most microgrids. So not surprisingly, of the $1.6 billion market GTM expects by 2020, generation represents the bulk of the investment (40 percent) followed by distribution (20 percent) and microgrid controllers and modeling (15 percent). The remainder of the money will be spent on project development, siting/engineering and energy efficiency upgrades, according to the report. When it comes to energy resources, U.S. microgrids tend to rely heavily on combined heat and power (CHP) and reciprocating engine generators. This is especially true of larger microgrids that solve grid problems or derive value streams from dispatchable power, according to Saadeh. While conventional fuels still hold sway in most states, California is an exception. Solar dominates because of the state’s strong renewable energy incentives, progressive utilities, and environmental leanings. Alaska also is an outlier because it favors diesel/wind hybrids, and increasingly flywheel storage, according to GTM. GTM predicts that microgrids will become increasingly green, but so far renewable growth has been uneven. Solar, the most frequently used renewable in microgrids, saw 45.5 MW of additions in 2012, but only 16 MW in 2013, 6.8 MW in 2014 and 5.7 MW in 2015. This year, however, the number of solar microgrids is climbing again with 26 MW installed already. Future prospects look good for solar microgrids, too, based on project announcements. While today solar makes up 11 percent of microgrid operating capacity, it represents 27 percent of the planned projects. Meanwhile, energy storage is becoming a cornerstone of microgrids, Saadeh said. Half of all operating microgrids employ battery storage. This is a recent turn of events. 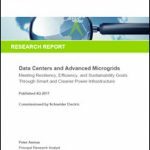 Of the microgrids that include storage, 42 percent were commissioned last year, according to the report. GTM expects to issue a research note in three weeks that will look at the microgrid vendor landscape. A great deal of vendor activity centers around the microgrid controller, according to Saadeh. As controller technology gains capabilities, he sees three trends emerging. First, distributed generation and storage manufacturers – such as Caterpillar, Tecogen and EnSync — are developing or licensing microgrid control technology for plug and play technology, suited for smaller, simpler microgrids. Second, larger technology companies that specialize in enterprise-wide utility systems are scaling down software suites with microgrid controls that serve location-specific needs on the grid. Some of these companies include Siemens, ABB, GE and Schneider Electric. And last, a new breed of microgrid control technology company, like Spirae, Opus One, Power Analytics and Microgrid Solutions, are developing targeted technology. Each is very different and addresses specific needs. By way of example, Saadeh pointed to the analytics dashboard and situational awareness technology produced by Power Analytics. “There is an enormous amount of potential for DG and storage manufactures to build out controls for plug and play functionality and eventually to have more capability to even operate a basic microgrid,” he said. So bottom line on GTM’s latest research? Microgrids are attracting new owners, getting smarter, and growing in numbers – and even faster than the research firm forecasted just three months ago. Track the US microgrid market by subscribing to the free Microgrid Knowledge newsletter.